Save money and energy every month on your utility bills, by contacting National Grid to book a no-cost assessment. Eligible customers can have their share of the efficiency improvements placed on their monthly electric bill for up to 24 months or pay in once lump sum and receive an additional 15 discount. If your organization is a house of worship, call 833-443-7473 to book your assessment. 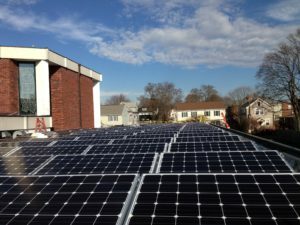 First Congregational Church recently installed a 101kW solar array that produces enough energy to cover nearly 70% of the church’s needs. The array and recent weatherization work are estimated to save the church $9k annually. Looking for a quick return on your investment? Here’s a laundry list of ideas from Energy Star to get started with saving energy that often have a rapid payback. Complete these before you invest in capital equipment to make sure you install only the equipment you need. The best part? These upgrades continue to save you money long after the initial project cost is paid off. To learn more about measuring your facility energy usage, visit Energy Star’s Portfolio Manager. Are you a house of worship? Learn more ways to save. National Grid also provides tips for businesses to save energy and save money that can apply to many non-profits. Schedule an energy assessment to examine where your facility has become inefficient and take action to make suggested improvements. Replace old fluorescent and incandescent lighting with T-8 (or even T-5) fixtures, ENERGY STAR certified CFLs or LEDs, and other energy-efficient lighting systems that improve light quality and reduce heat gain. CFLs cost about 75 percent less than incandescent to operate, and last about 10 times longer. Install occupancy sensors to automatically turn off lights when no one is present and back on when people return. Storage rooms, back-of-house spaces, meeting rooms, and other low-traffic areas are often good places to start. Before you begin, check with National Grid as they will most likely offer incentives. Occupancy sensors can save between 15 and 30 percent on lighting costs. And don’t forget — even good equipment can be installed incorrectly, so don’t install the sensor behind a coat rack, door, bookcase, etc. It must be able to “see” an approaching person’s motion to turn on the light as they enter an unlit room. Purchase energy-efficient products like ENERGY STAR certified office equipment, electronics, and commercial cooking/cleaning equipment. Purchase ENERGY STAR certified commercial food service equipment. For example, certified refrigerators and freezers can save over 45 percent of the energy used by conventional models, which equals as much as $140 annually for refrigerators and $100 for freezers.